Awhile back, we dined at Mr. Cecil's California Ribs on Pico Blvd. in West L.A. 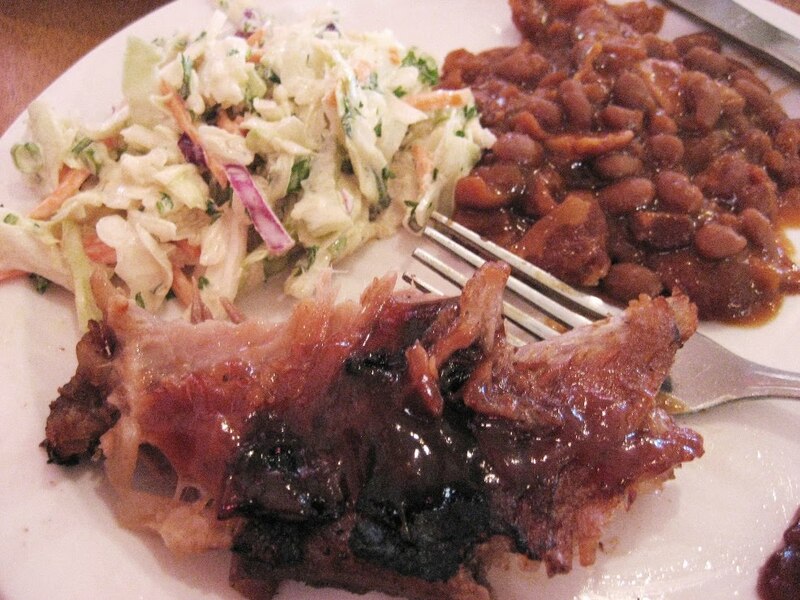 I just LOVE Mr. Cecil's St. Louis ribs. They are perfectly cooked and require little or no sauce. Yum. This branch of Mr. Cecil's (there are branches in Sherman Oaks and Manhattan Beach), resides in a former Chile Bowl restaurant....a very historic building. This type of architecture is called "programmatic" architecture...the restaurant looks like a chili bowl!! 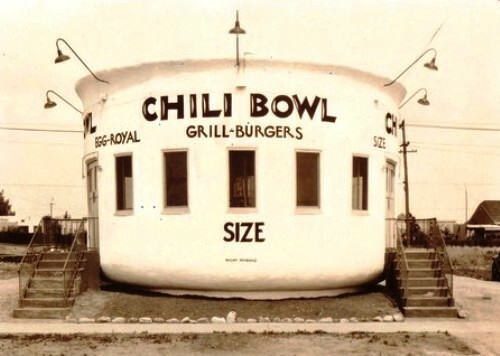 In 1931 Art Whizin opened a restaurant shaped like a chili bowl, and 22 others followed. The popular dish is long gone, but a few of the circular buildings are now serving up something different. The way Art Whizin told the story, he was sitting at the counter of a downtown burger joint called Ptomaine Tommy's, trying to visualize the restaurant he wanted to build. Then a truck-driver friend next to him slid over a chili bowl and said, "Here, Whizin, do something with this." And that's how Whizin, the one-time amateur boxer, decided in 1931 to construct an eatery in the shape of a chili bowl. Why not? Merchants were putting up businesses that resembled ice cream cones, tamales, coffee kettles and sundry other objects -- all trying to catch the eye of passing motorists. The 25-year-old entrepreneur opened his first Chili Bowl on Crenshaw Boulevard near Jefferson Boulevard after raising $1,200 by selling, among other things, his wife's wedding ring and his roadster. The couple moved into a house nearby. "Because he sold his car, he had to have his business within walking distance," explained Jim Heimann, author of "California Crazy & Beyond," a study of offbeat roadside architecture. Whizin told Heimann in a 1978 interview that he sketched the design of the restaurant on the corduroy pants he seemed to always be wearing. Perhaps he didn't want anyone else to get their hands on the plans. Or perhaps "he was embellishing the story," Heimann said with a laugh. "He was an interesting character." The Chili Bowl had no tables, just a 26-stool circular counter, and Whizin bragged that his young workers, most of them college boys, could "flip a pat of butter from the center of the counter to the edge of any of the 26 plates." The place was an immediate success with its specialty dish called the chili size, an open-faced hamburger smothered with the homemade goodness. The restaurant was so popular, in fact, that the owner painted a "Pat. Pending" notation on the outside, thinking his design was unique enough to be patented. Instead, he drew fan mail addressed to "Pat Pending." Before the decade was out, Whizin had built 22 more Chili Bowls, including one on Florence Avenue in Huntington Park that, he recalled, was the only structure on the block that was undamaged by the 1933 Long Beach earthquake. "It's because of the circular shape," he told the Times in 1985. "It gave evenly in all directions. The place was full and all 26 customers ran outside. After a couple of minutes, they peered inside the window, saw everything was OK and came back and finished their chili." 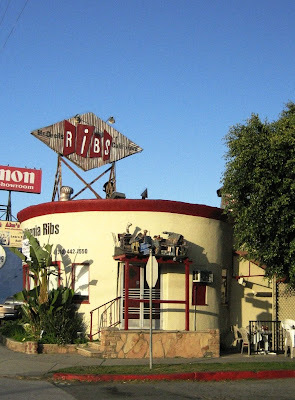 I never ate at this place when it was The Chili Bowl, however I did frequent it when it was Pancho's Mexican Restaurant, next to the old Music Machine night club in the 80's and early 90's. Sorry to have missed you & Larry at Claire's and Tom's shared birthday soirée. However, reading each and every installment of your wonderful blog will have to suffice for the time being. Writing, photos but, best of all, your unabashed L.A.-philia makes this one of my favorite reads of a given day. Hi Richard! Sorry we missed you at Tom's and Claire's too. We arrived late due to the observance of Yom Kippur with the family! Glad you like my blog! Thanks for the compliments!